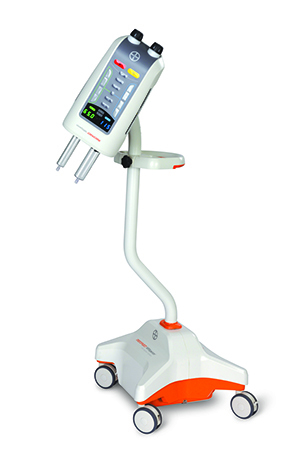 The Medrad MRXperion MR injector is Bayer’s first MR power injection system to utilize the Radimetrics Enterprise Platform for delivering personalized features such as modality worklist connectivity and protocol storage and retrieval a the point of care. Designed to improve workflow efficiency, the system enables the recording and report of MR contrast-enhanced procedure data through the Radimetrics informatics solution. MR informatics may also help enhance operational consistency by interfacing with PACS, RIS and speech recognition, including the ability to export DICOM secondary capture to PACS. For efficiency, Medrad MRXperion features a snap-on/twist-off syringe design, automatic plunger advance and retract when attaching and detaching syringes and automatic filling and priming. It boasts a patient-centric workflow design with modality worklist connectivity, protocol storage and retrieval and an on-board eGFR and weight-based dosing calculator. The system also offers automated data capture via the Radimetrics Enterprise Platform. Bayer’s Radimetrics Enterprise Platform is an informatics tool that can be used across different modalities—MR, CT, X-ray, interventional and mammography. The platform merges patient radiation dose histories and current exam details across the enterprise to further enable radiation dose management and contrast dose analytics. Personalized dashboards can be created and shared with key team members to conduct analyses on-demand and help with consistency of practice standards and operational efficiency. The Radimetrics Enterprise Platform can also be tailored to the needs of individual organizations to provide either comprehensive features of the full Radimetrics package, or customized options for radiologists and hospital systems. It can help administrators further standardize protocols for efficiency and to local regulations and national compliance standards. In addition to advanced contrast dose analytics, the latest software version also includes RadLex Playbook (protocol descriptors), offering a standard system for naming radiology procedures (a license is required), an expanded library of dashboards, including default starter dashboards, and the ability to obtain scanner related data from DICOM tags, providing additional information regarding patients and exam views. New MR Injector, Radimetrics Enterprise Platform Highlighted by Bayer. Appl Radiol.